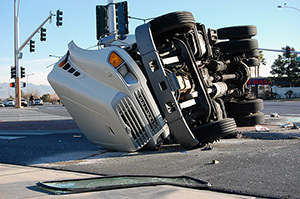 Truck accidents can be much more complicated than a standard auto accident. This is largely due to the intermixing of federal and state law, as well as the number of parties who can be held liable for the wreck. The lawyers at The JW Law Firm have plenty of experience dealing with these types of accidents and know how to navigate the complex cases that surround them. Those involved in a truck accident usually incur very serious injuries. If you or a loved one have been injured in a truck accident, call The JW Law Firm. We’ll fight to make sure you receive just compensation so that you can get back to living and enjoying your life. Truck accidents are serious, and it’s important that you follow the proper steps if you ever experience one. The first thing anyone should do after being in an accident is to seek medical treatment from a licensed professional. You don’t want your injuries to impair you for the rest of your life, so if you can help it, you should. Having a doctor examine you also lets you know the extent and severity of your injuries. This helps you know what you have to do to recover, plus it provides you with valuable documentation. Your attorney can then use these medical documents as evidence to build your case. Investigate whether or not the vehicle was properly maintained. Make sure the trucking company was following federal and state trucking laws. Examine police reports, photographs, video footage, witness interviews, etc. While we are conducting our investigation, it is important that you do not contact or respond to any attempt at communication with the other parties’ insurance company. They will try to get information from you that could hurt your case and cause you to receive less than your due compensation. The only people you should be sharing information with are your lawyer and doctor. After all the evidence and data of been gathered, your attorney can then create your claim. The claim will state your injuries, show how the other party or parties is/are negligent, and request compensation for your losses. Your claim will then be used as the basis for your lawsuit, which may resolve in a settlement or case ruling. As a first resort, your attorney will meet with the at-fault party or insurance company to reach a settlement agreement. If one cannot be reached, we will take your suit to court. During this time, it is still possible for a settlement to be made, but if not, it will be up to the judge or jury to determine what you will receive in recompense. If you or a loved one has been injured in a truck accident, please do not hesitate to call The JW Law Firm. We will fight for you and get you the compensation you deserve.